They are not meant to make Conservative leaders like David Cameron any more. After 40 years in which the party has chosen state-school educated leaders of relatively humble origins, Mr Cameron is straight out of the Establishment top drawer. Examination of the huge amounts of column inches devoted to him during the campaign shows his Conservative bloodline is impeccable, including three prominent Conservative MPs of the late 19th and early 20th Century. He is the first Eton-educated Conservative leader since Sir Alec Douglas-Home in the early 1960s and is a member, along with Prince Charles and his sons, of exclusive Mayfair gentleman's club White's. He is even, it turns out according to reports this week, distantly-related to the Queen. 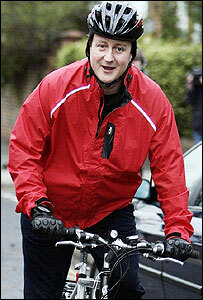 Yet with his mountain bike and fondness for indie rock music Mr Cameron also likes to be seen as a man of the people. Recently, in a bid to dispel his "toff" image, he told the Sun newspaper he enjoys a pint of real ale, rather than champagne, and that he smokes Marlboro Lights cigarettes (a habit he has repeatedly vowed to quit). He launched his leadership campaign at a community radio station, where he felt comfortable telling listeners to "keep it real". He describes his current favourite music as The Killers, and his favourite album of all time as the Queen is Dead, by The Smiths - hardly the choice of a port-swilling Tory grandee. David William Duncan Cameron was born on 9 October 1966 in London. The son of a stockbroker, he spent the first three years of his life in Kensington and Chelsea before the family moved to an old rectory near Newbury, in Berkshire. He had what he describes as a "happy childhood", with his brother Alec and sisters Tania and Clare. His father Ian is a former director of estate agent John D Wood and stockbrokers Panmure, where Mr Cameron's grandfather and great grandfather worked. But the new Tory leader gains his political lineage from his mother's side of the family, whose ancestral home was Wasing, in Berkshire. His great, great, great grandfather, William Mount, was Conservative MP for the Isle of Wight in the 19th Century. Mr Cameron's great, great grandfather also called William Mount, sat for Newbury, before passing the seat on to his son Sir William Mount, the first baronet and David Cameron's great grandfather. After prep school, young Dave, as he was then called, followed in the family tradition and went to Eton. In a strange twist of fate his headmaster, Eric Anderson, had been Tony Blair's housemaster at Fettes public school, sometimes dubbed the Scottish Eton. School friends say Mr Cameron was never seen as a great academic - or noted for his interest in politics, beyond the "mainstream Conservative" views held by most of his class mates. His biggest mention in the Eton school magazine came when he sprained his ankle dancing to bagpipes on a school trip to Rome. Before going up to Oxford to study Philosophy, Politics and Economics he took a gap year, working initially for Sussex MP Tim Rathbone, before spending three months in Hong Kong, working for a shipping agent, and then returning by rail via the Soviet Union and Eastern Europe. After gaining a first class degree, Mr Cameron answered an advertisement for a job in the Conservative Research Department. He progressed quickly through the ranks and was soon briefing ministers for media appearances. He worked with David Davis on the team briefing John Major for Prime Minister's Questions, and also hooked up with George Osborne, who would go on to be shadow chancellor and his leadership campaign manager. Jeff Randall, writing in The Daily Telegraph where he is a senior executive, said he would not trust Mr Cameron "with my daughter's pocket money". "To describe Cameron's approach to corporate PR as unhelpful and evasive overstates by a widish margin the clarity and plain-speaking that he brought to the job of being Michael Green's mouthpiece," wrote the ex-BBC business editor. "In my experience, Cameron never gave a straight answer when dissemblance was a plausible alternative, which probably makes him perfectly suited for the role he now seeks: the next Tony Blair," Mr Randall wrote. Sun business editor Ian King, recalling the same era, described Mr Cameron as a "poisonous, slippery individual". In 2001, he won the safe Conservative seat of Witney, in Oxfordshire, recently vacated by Sean Woodward, who defected to Labour. Mr Cameron was by now a married man with a family. His wife, Samantha, is the daughter of landowner Sir Reginald Sheffield, she grew up on the 300 acre Normanby Hall estate, near Scunthorpe. Her step father, Viscount Astor was a minister in John Major's government, with responsibility for broadcasting. Until recently Mr Cameron sat on the board of late night bar operator Urbium with Viscount Astor. Mrs Cameron, who works as the creative director of upmarket stationery firm Smythson's of Bond Street, which counts Stella McCartney, Kate Moss and Naomi Campbell among its clients, has been credited with transforming her husband's staid "Tory boy" image. The couple were introduced by Mr Cameron's sister Clare, Samantha's best friend and were married in 1996. Their first child, Ivan, was born severely disabled and needs round-the-clock care. They also have a daughter, Nancy, 23 months, and Samantha is pregnant with their third child. They divide their time between their London home in North Kensington and a cottage in Witney, Oxfordshire. On entering Parliament, Mr Cameron rose rapidly through the ranks, serving first on the Home Affairs Select, which recommended the liberalisation of drug laws. He was taken under the wing of Michael Howard, who put him in charge of policy coordination and then, in May this year, shadow education secretary. He also served as shadow deputy leader of the house and deputy party chairman. In his spare time, Mr Cameron plays tennis, often with former leadership rival Liam Fox, and enjoys dinner parties with his close-knit circle of friends, dubbed the Notting Hill set. Ms Whetstone's partner, ex-adman Steve Hilton, advises Mr Cameron on presentation. Another friend, Times journalist and newly-elected MP Michael Gove was a key member of his campaign team. With his influential friends and blue-blooded heritage, Mr Cameron has been criticised for not being in touch with ordinary people. But his easy manner and confidence in front of the television cameras allows him to appear - if not exactly classless - then certainly not the upper-crust figure his background might suggest.